Former 2-time IBF bantamweight champion of the world, Joseph King Kong Agbeko (34-5, 25 KOs) is not going anywhere soon as he keeps focus on chasing another world championship with a first defence of his WBO Africa bantamweight title against compatriot, Ekow Wilson (18-2, 16 KOs) in Ghana’s Volta Region capital of Ho come September 8, 2018. Agbeko who also won the WBF bantamweight title way back in 2001 as well as the IBO bantamweight title in 2013 during a glittering pro career spanning 20 years, annexed the regional belt in March this year courtesy a unanimous decision win over Ugandan hotshot, Frank Kiwalabye in the Ghana border town of Aflao, on the back of which the Ghanaian nows sits pretty at number 10 in the world ratings to the belt held by Solani Tete of South Africa. 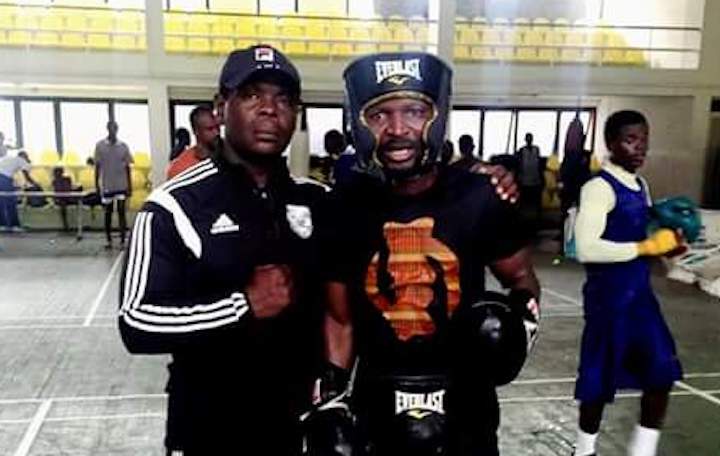 Now Agbeko, who is training under the direction of experienced Ghanaian coach, Ofori Asare in Accra can improve his position in the WBO rankings by taking down Wilson whose only two career defeats came in previous shots at the same WBO Africa bantamweight title in March 2014 and December 2015 both times to Duke Micah, another world title chasing Ghanaian who is incidentally currently number 3 in the WBO rankings. Also fighting on the bill promoted by Aborigines Promotions christened ‘Polopala Homecoming’ scheduled for Woezor Hotel in Ho is local favourite, Anama Dotse AKA Polopala who takes on Sani ‘Uganda’ Yidana Kugblie in a super lightweight contest over 8 rounds. Also featuring on the fight show part of the annual yam festival of the people of Ho, is highly rated Ghana based Togolese, John ‘Africa Tyson’ Koudeha who comes up against Kwesi ‘Dark Destroyer’ Tutu in a catchweight middleweight contest, Dodzi ‘Zewuze’ Kemeh versus Francis ‘Red Pepper’ Mensah in a welterweight contest and Nathaniel ‘Engine’ Nukpe against Moses ‘Bomber’ Dodze at super featherweight. Other fights concluding the undercard line-up of the Rumble in Ho come next month are Victus ‘Ho Warrior’ Kemevor up against Emmanuel ‘Hot Punisher’ Allotey in a welterweight contest as well as a lightweight clash between Samuel ‘Powers’ Klutse Tordzro and Enock ‘Amazing’ Owusu.